The first thing to look at is your original Solar Garden Light Batteries. It is best to match the "mAh" figure on your batteries with the rechargeable batteries in the range. Installing the correct batteries will ensure your lights work straight away and perform properly throughout their life. When first installed, these AA NiMH batteries will have some charge but will benefit from a good sunny day to charge them up. If you have a normal household battery charger, you can give them a headstart by charging them up before installing them in your Solar Garden Lights. AA size 1.2V 150mAh Ni-MH rechargeable batteries for Solar Lights. These batteries are the direct replacement if you have NiCd or NiMH batteries in your lights. 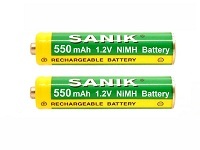 AA size 1.2V 250mAh Ni-MH rechargeable batteries for Solar Lights. These batteries are the direct replacement if you have NiCd or NiMH batteries in your lights. AA size 1.2V 300mAh Ni-MH rechargeable batteries for Solar Lights. These batteries are the direct replacement if you have NiCd or NiMH batteries in your lights. AA size 1.2v 400mAh Ni-MH rechargeable batteries for Solar Lights. These unusual capacity batteries are the direct replacement if you have NiCd or NiMH batteries in your lights. These AA size 1.2V 600mAh recgargeable NiMH batteries are the direct replacement for your Solar Garden Lights. Whether you have NiCd or NiMH batteries already installed, these will get your lights up and working again. AA size 1.2v 900mAh Ni-MH rechargeable batteries for Solar Lights. These slightly higher capacity than usual Solar Light batteries are the direct replacement if you have NiCd or NiMH batteries in your lights. These AA size 1.2v 1000mAh Ni-MH rechargeable batteries are for Solar Lights. These slightly higher capacity than usual Solar Light batteries are the correct replacement if you have NiCd or NiMH batteries in your lights. AA size 1.2v 1300mAh Ni-MH rechargeable batteries for Solar Lights. These higher capacity than usual Solar Light batteries are the direct replacement if you have 1300mAh NiMH batteries in your lights.